We are a true community pub owned and run by locals, used by locals and appreciated by visitors as being a cut above the usual chains. 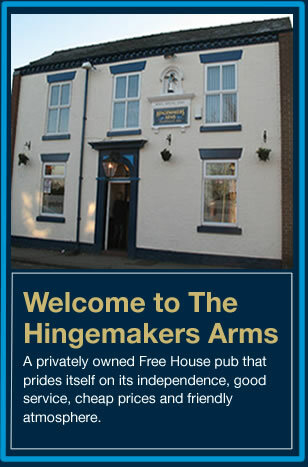 The Hinge has recently seen its facilities and the furnishings improved to make it a more comfortable place to be, but great care was taken to ensure all of the pub's character was retained. The pub is fully independent and is run to benefit those who drink in it and the prices and the various events held there reflect this. The main clientele who use the pub are people who value a community pub where you can drink in a relaxed atmosphere. Small groups of away fans visiting one of the North West teams of Man Utd, Man City, Everton, Wigan, Liverpool etc – all of which are approx 30 minutes away.